The Berkeley High School Judo Program and LSI, with the help of Brazilian Senseis Newton Casemiro, American Dan Augustine, found a very nice way to teach and learn about American, Brazilian and Japanese cultures. 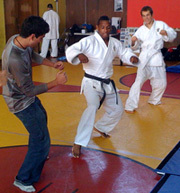 LSI Berkeley students participated in judo lessons and taught American high school students about Brazilian disco dancing and typical food, as well as Japanese origami, sushi and many other interesting cultural activities. It was a great experience for both our LSI students and Berkeley High School.